Over the past 10 years, and particularly after the publication of the Global Burden of Disease , significantly more attention has been paid to mental disorders of childhood and adolescence. Recent data have shown that between 3% and 18% of children suffer from psychiatric disorders, and these disorders can cause significant functional impairment . In addition, psychiatric disorders can be identified in 25 - 75% of patients with juvenile neurological disorders such as epilepsy, tic disorders or mental retardation [3-6]. Therefore, in several settings (e.g., clinical assessments, epidemiological studies of neurological disorders in children), it is important to screen for psychiatric disorders. While short screening measures are sometimes preferable, these do not necessarily produce diagnostic categories based on Diagnostic and Statistical Manual of Mental Disorder (DSM) criteria . The DISC Predictive Scales (DPS) are a series of diagnosis- specific short-forms of the Diagnostic Interview Schedule with Children (DISC), and include only the DISC items that are most predictive of DSM-IV DISC diagnosis . The full DPS can be used to accurately screen for specific DSM disorders, and they also have the potential to considerably speed up structured diagnostic interviewing . Although the screening efficiency of the DPS has been widely examined, showing high sensitivity, specificity and negative predictive values [10-12], only a few clinimetric attributes such as test-retest reliability and internal consistency have been examined in English versions [10,11]. Therefore, this study was firstly aimed to analyze the remaining psychometric attributes of the DPS (validity, precision and some aspects of acceptability) and to test the screening efficiency of a Spanish version of the DPS against the Spanish DISC-IV, in a school-based sample of children and adolescents in Spain. The following measures were administered: 1) The computerized Spanish Generic DISC-IV , a respondent-based structured interview with parallel parent and youth (9-17 years) versions. This scale includes 358 stem questions and nearly 1,300 contingent questions. Using the previous 12-months as a time frame, the DISC-IV may be used to generate more than 30 DSM-IV childhood diagnoses. For this study, the following DISC-IV modules were administered: anxiety disorders, mood disorders, disruptive behaviour disorders, and alcohol/substance abuse; 2) An updated computerized Spanish version of the original DPS, provided by the developing authors (CP Lucas), which contains 18 subscales (agoraphobia, social phobia, specific phobia, generalized anxiety disorder, obsessive-compulsive disorder [OCD], major depressive disorder, attention-deficit/ hyperactivity disorder [ADHD], oppositional defiant disorder, and conduct disorder, alcohol, marijuana and other substances abuse). The DPS is made up of a brief diagnosis-specific self-report inventory to identify youths endorsing symptoms and who are highly likely to meet diagnostic criteria . The DPS also measures impairment with seven questions that inquire about parent and teacher reactions to, and limitations resulting from, youths’ feelings and behaviour. The total DPS score is therefore the sum of DPS symptomatology and DPS impairment. We used the cut-off scores for an adolescent population provided by the original developers [9,14] (see Table 2). 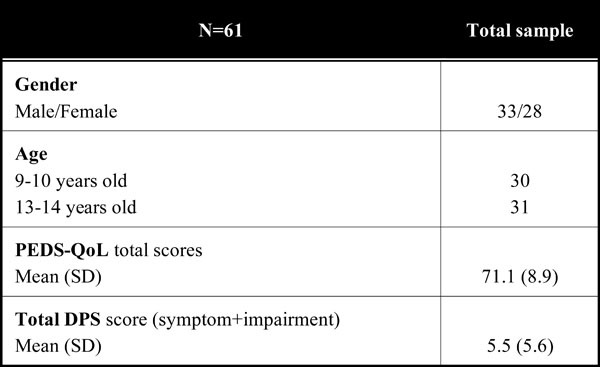 A DPS total score ≥ 9 indicated the presence of probable mental disorders when at least social phobia, general anxiety, depression alcohol, marijuana and other substance have been included in the screen; 3) A Health-Related Quality of Life Scale (HRQoL): Peds-Qol 4.0 (Spanish version of the Paediatric Quality of Life Inventory) Generic Core Scales , as a self-report HRQoL measure for children and adolescents. In this scale, items are reverse scored and linearly transformed to a 0-100 scale, so that higher scores indicate better HRQoL. Fifty six (92%) subjects screened positively for at least one DPS symptom, and co-occurrence of any DPS symptom was high (41 subjects [71%]). However, the overall prevalence of any possible psychiatric disorders (based on the DPS with a total cut-off score ≥9) was 5.3% (10 subjects), and 6.3% (12 subjects) with the DISC-IV. Based on the DISC-IV, the most frequent disorder was specific phobia (6 subjects [10%], followed by OCD (3 subjects [5%]), ADHD (2 subjects [3%]), and anxiety separation, conduct disorder, alcohol abuse in 1 subject [2%], respectively. 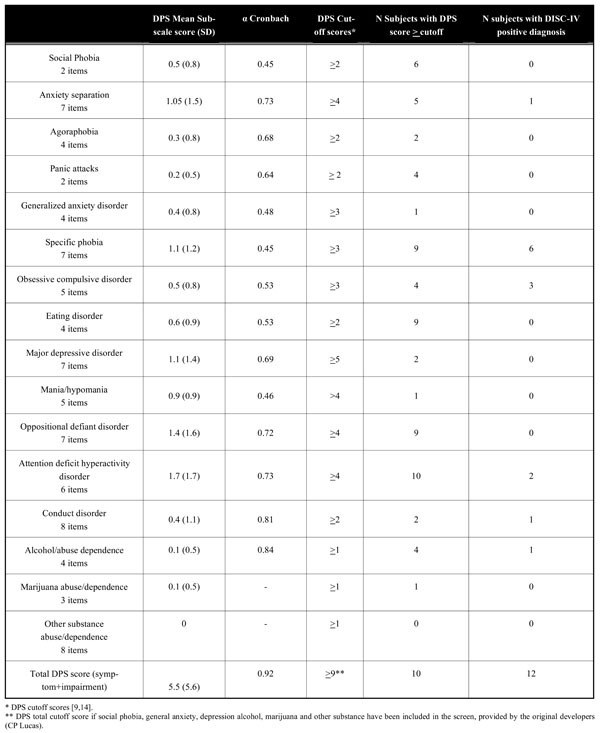 Likewise, among those patients who fulfilled criteria for a possible psychiatric diagnosis based on the DPS cut-off scores (see Table 2), the most frequent possible diagnosis was specific phobia (5 subjects [8%]), followed by ADHD (4 subjects [6%]), and the remaining in less than 5% of the subjects. Overall, the DPS showed a low sensitivity, especially in OCD and specific phobia (41% for any DPS diagnosis, and 33%, for OCD and specific phobia, respectively), but with excellent specificity and NPV. 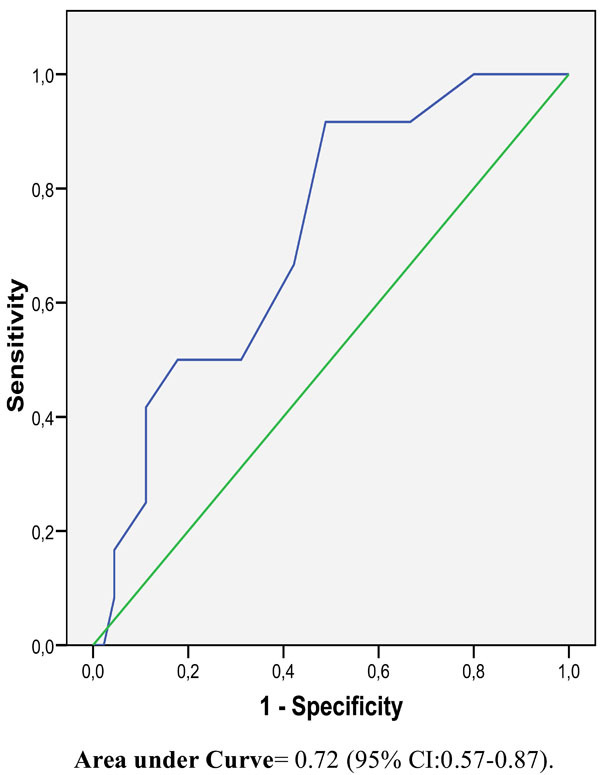 The overall DPS AUC was 0.72 (95% CI: 0.57-0.87) against DISC IV corresponding diagnosis (Fig. 1, Table 4).